The snow welcomes the University of Colorado Homecoming Weekend here in Boulder, but don’t worry, the temperatures will be back to 60 just in time for the CU vs. Cal game. It’s my senior year here at CU, and although I’m excited to graduate, every “last” is a little bit nostalgic. (Luckily, Homecoming continues post-grad!) This year is extra special as it is Ralphie’s 50th Anniversary as the CU mascot. Since 1967, Ralphie has led the football team out onto the field with fans cheering wildly. After Ralphie I’s first run, everyone knew that Ralphie was going to be a long-standing tradition. The current Ralphie, Ralphie V, is in her 10th season as CU’s live-mascot. Ever since I was a child, I have always loved seeing Ralphie run around the stadium, and find her to be one of the best parts of CU football games. Ralphie is also arguably the best college mascot there is, however I may be slightly biased. You can even meet Ralphie at Ralphie’s Corral prior to kickoff during the official CU Tailgate (Saturday at 9am at Benson Field). This entire week has been very celebratory on campus, with barbeques, concerts, carnivals, and even yoga! The celebration does not stop there, and continues tonight with the Pearl Street Stampede. This Stampede will be a Homecoming Parade and Pep Rally. Prior to the Stampede there will be an Alumni Spirit tent, where anyone can get their CU spirit gear for the weekend. You can also stop by Where the Buffalo Roam, Jackalope, or Charlie's T-Shirts for more CU apparel. At 7pm, begin marching down Pearl Street Mall alongside the CU Marching Band, spirit squads, student athletes and hundreds of alumni! 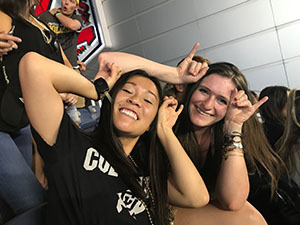 There is no doubt that once a Buff, always a Buff, and the celebrations for Homecoming certainly don’t sell that short. Kickoff for Saturday’s game is at 12 pm, and you can be sure to experience a stadium filled with passionate CU game day spirit! 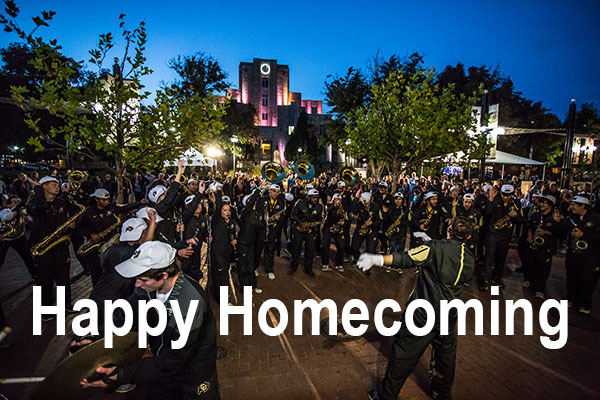 To get more information on Homecoming Weekend, visit CU Boulder Homecoming.